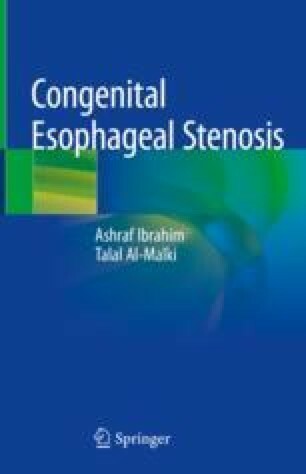 CES is defined as esophageal narrowing present at birth, but not essentially symptomatic, due to intra-luminal membranous disease (MD), intrinsic disease with textural abnormalities or extramural compression. The intrinsic causes involve a type with tracheobronchial remnant (TBR), another with segmental hypertrophy of the muscularis and diffuse fibrosis of the submucosa (FMD). A definitive incidence of subtypes cannot be determined. CES represents a wide spectrum of diseases. It can be associated with esophageal atresia (EA) or it can be an isolated lesion. The association of CES and EA ranges from 0.4 to 14%. CES may have associated EA in 20–60% of cases. CES associated with EA may affect the anastomotic site or distal to or it may involve the whole lower esophageal pouch. CES distal to the anastomotic site may be proximal to the gastroesophageal junction (GEJ) allowing free GER. An isolated CES can affect any part of the esophagus; upper, middle, lower esophagus or even the cardiac end mimicking cardiac achalasia. The MD may be an isolated lesion or associated with EA. It may be a complete diaphragm or a perforated one. Associated anomalies with CES may be as high as 17–52.5%.